While the dust may now have settled on last week's OPEC meeting, the cartel's impact on U.S. oil inventories is set to linger on. Stocks are at their lowest level since January 2016, and are down over 80 million barrels from their peak in March - in spite of a 30 million barrel injection from the SPR. As we head into the holiday season, the U.S. should expect little in the way of holiday cheer from OPEC flows. 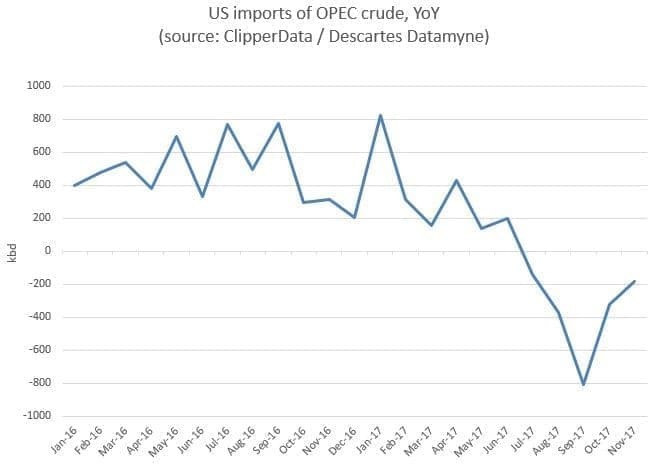 U.S. imports of OPEC crude have averaged 3.26 million barrels per day through the first eleven months of this year, a smidge higher than last year's average. Although imports started out the year at 3.7mn bpd in January, the highest monthly level since 2013, we have seen them dropping below the 3mn bpd mark in recent months - led by a significant drop in deliveries from Saudi Arabia. October and November imports have rebounded close to the 3mn bpd mark, but not enough to help imports clamber back to a year-over-year surplus. 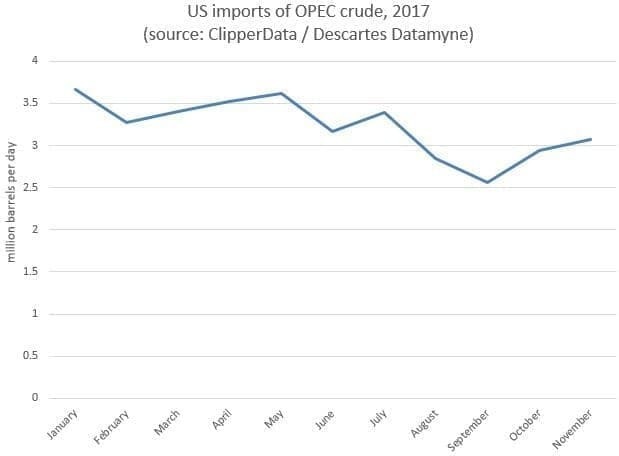 As for this month, December's OPEC imports are almost certainly going to finish at a deficit to last year's level, given a pre-OPEC-production-cut-deal ramp-up last Yuletide. Saudi arrivals rebounded in November, but by no means to the level witnessed in recent years. We have seen Saudi imports just edge out Iraqi flows in November, but this tussle looks set to persist - as Saudi shows OPEC compliance discipline via lower exports, while Iraq does not. (n.b. 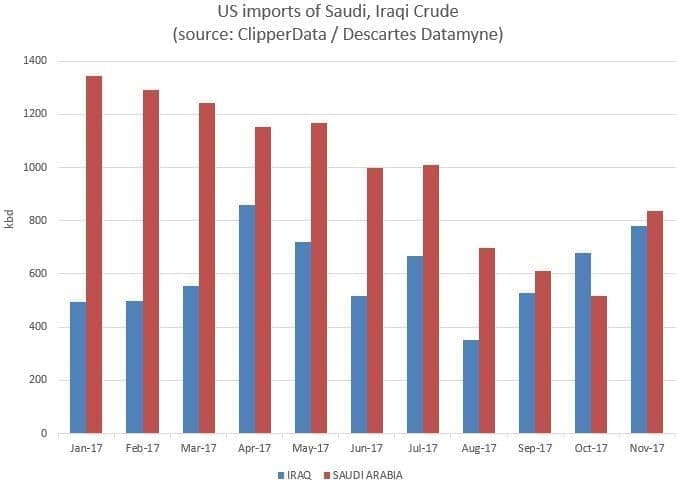 the U.S. doesn't receive crude from northern Iraq, where flows have dropped - only from Basra, in the southern part of the country). We spoke about lower Venezuelan crude flows to the U.S. last week. But we have also seen lower NAF and WAF (North African, West African) flows in the last month. 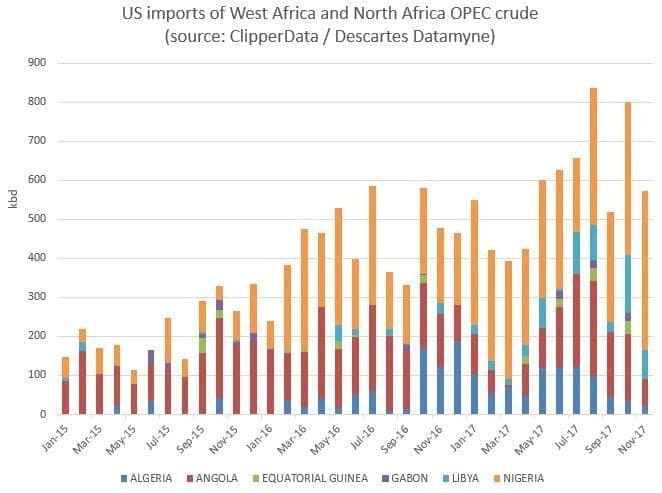 Imports from Angola have dropped off, as it has favored sending crude to its leading destination, Angola, instead. Libyan imports have dropped off too, sending higher flows to Europe and Asia instead, while Algerian loadings of Saharan blend bound for the U.S. were completely absent in October - for the first month since January 2015 - also favoring Asia. 2.4 million bbls removed from the SPR again this week. Where did this go Cushing? I like how the US uses the SPR as a wild card to drive down price. How long can they keep it up?